Select the application whose data should be displayed. Select the data group whose data should be displayed. Select the data field where the value, which you want to reference, is saved. Because users can adjust the order of entries in the sortable list as they choose, the current order needs to be saved in each case. 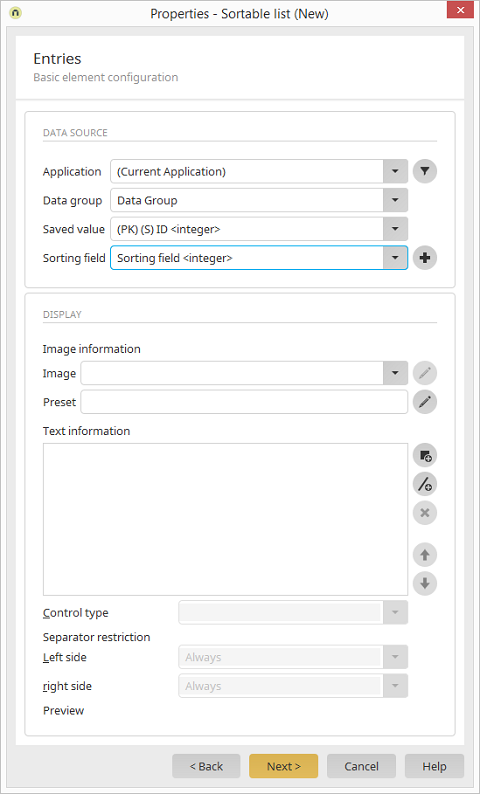 Here, a sorting field, which has to have integer as its data type, can be selected. The corresponding values are saved in this field. As the sorting field, please do not use an existing field from your application where data is already stored. This data would be replaced by the value of the order when the list is sorted. Opens a dialog where a new sorting field can be created. A data field with the data type file, where links to images are stored, can be selected here. The image defined here is displayed if an image is not availabel when a new data record is created. Data fields, whose values should be displayed in the list, can be integrated here. Opens a dialog where a data field, which provides the displayed value, can be selected. Adds a row to the list where a separator, which is shown between entries, can be entered. Removes the currently selected displayed value from the list. Select the control type for the currently selected displayed value. The display of each separator can be prevent if the displayed value is empty. A separator will always be displayed on the left or right of the displayed value respectively. A separator will be displayed on the left or right, respectively, if the text on the left or right, respectively, is not empty. A separator will be displayed on the left or right, respectively, if the data field on the left or right, respectively, is not empty. At the bottom, you can see a preview of the list with the current settings for displayed values and separators.